Big Joe Williams (born Joseph Lee Williams, October 16, 1903 - December 17, 1982) was an American blues musician and songwriter, known for his characteristic style of guitar-playing, his nine-string guitar, and his bizarre, cantankerous personality. Born in Crawford, Mississippi, Williams performed frequently, wandering across the United States busking and playing stores, bars, alleys and work camps, as well as recording for Okeh, Bluebird Records, Delmark Records, Prestige Records and Vocalion. 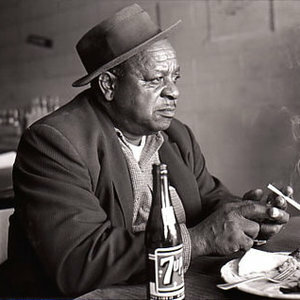 Born in Crawford, Mississippi, Williams performed frequently, wandering across the United States busking and playing stores, bars, alleys and work camps, as well as recording for Okeh, Bluebird Records, Delmark Records, Prestige Records and Vocalion. Big Joe's guitar playing is decidedly in the Delta Blues style, and yet is unique. He played driving rhythm and virtuosic lead lines simultaneously, and sang over it all. He played with picks both on his thumb and index finger, plus his guitar was very heavily modified. Williams added a rudimentary electric pick-up, whose wires coiled all over the top of his guitar. He also added three extra strings, creating unison pairs for the first and second courses and an octave pair for the fourth course.